My wife and I have taken a couple of tour-type vacations. You know, the ones where a guide takes a whole group of you around on a big tour bus. This kind of trip has a few distinct advantages, but experiencing authentic, unscripted local culture is not one of them. Generally, you're steered to events that appear to be staged especially for tour groups and, uncannily, they always manage situate you so you can’t get back to the bus without a trip through the gift shop. Traveling on one's own, especially if you can do so with someone who lives there, often proves richer and more memorable. For it’s one thing to witness the culture of a place and a people; it’s another to live it. It’s a rare opportunity, one that seldom occurs without a convergence of effort, connections, and timing. Oh, and sheer dumb luck. The weather in Mexico City was sunny and clear, but for the usual blanket of brown smog pressing down on this, the sixth largest city in the world. 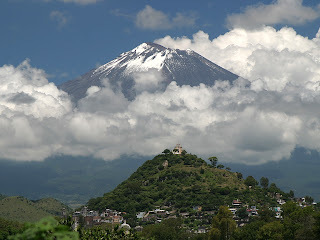 It was clear enough, though, to see Popocatepetl, crowned with clouds. Popo, Mexico’s most active volcano, is only 45 miles away from the center of Mexico City and her 20 million inhabitants and about half as far from Puebla, with another two million. It is within striking distance of all of them, a cataclysm-in-the-making, since eruptive activity has occurred as recently as January, 2008. I was traveling with my Mexican-American friend and Spanish tutor, Silverio, along with two of his other students, Anne and Kip. Silverio’s friends, Ignacio (Nacho) and his wife Martha, picked us up in the van he’d rented for us for the week. We drove right from the airport about 80 miles southeast to the state of Puebla and the small village of Santiago Tenango de Reyes, where we were to attend the wedding fiesta for one of Nacho's friends. We three unusually tall, unusually pale norte- americanos) walked in to what seemed only slight curiosity from the 100 or so locals. As we drove into Santiago, we realized just how small a town it was—only about eight blocks long and maybe three or four wide. Its population couldn't have been more than a couple hundred. We parked the van and walked a couple blocks on nearly-deserted cobblestone streets before we came to a broad alley between two cinder block buildings. There the stark space had been converted into a cheery hall by a huge bright yellow-and-green-striped tarp strung between the second stories above. 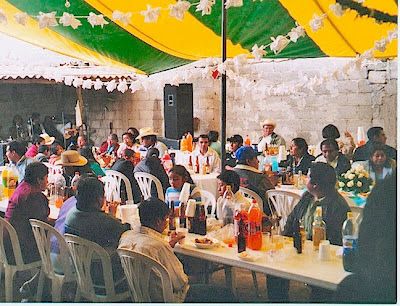 The six of us (Silverio, Nacho, Martha and we three unusually tall, unusually pale norte- americanos) walked in to what seemed only slight curiosity from the 100 or so locals—evidently half the folks in town—sitting at long rented tables. 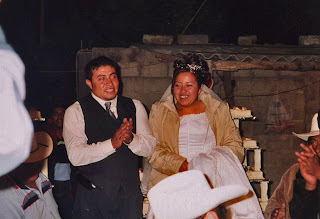 Within a minute, though, Nacho was proudly introducing us to the bride and groom (the groom Nacho’s co-worker in Mexico City), to the groom’s parents and to the couple’s padrino (something like a godfather). Pony beers and tequilas were in seemingly endless supply, and for the rest of the evening were cheerfully placed into whichever of our hands happened to be free at any time. A ten-piece mariachi band dispensed its energetic music from the far end of the hall. The charro, or lead singer, is one of Nacho's cousins. Before I knew it, he was announcing something into the microphone about guests from far away and then something more familiar: “...por Cheff, de Meeny-sota…” Suddenly, I was aware that all the guests had now stopped talking and turned to look at us. The next song, apparently just dedicated to me by Nacho, was Como Quien Pierde una Estrella (Like One Who Loses a Star), my favorite of the songs Silverio had taught us in class. I always love mariachi music, but I was especially moved by this rendition and Nacho's thoughtful gesture! I kept wondering if I'd be so generous and thoughtful if roles were reversed. After about an hour the parents of the groom asked us to join them. Leaving the other guests to their dinners, we walked about a block down the street to their home. Waiting for us inside were the bride and groom, still in their wedding finery, five or six other adult members of the immediate family and a few kids. We sat down at the dining room table and were served what Silverio explained is a sort of appetizer course traditional for weddings: two types of tamales freshly steamed in corn leaves, two bright little gelatins which tasted like they might have been flavored by chiles, a sweet, crispy, deep-fried sort of cookie, and atole, a hot, creamy, corn-based drink flavored with chocolate, cinnamon or other notes. It was already the experience of a lifetime just to attend the fiesta, but this—being welcomed like this into this dear family—made us feel deeply honored. I kept wondering if I'd be so generous and thoughtful if roles were reversed. (WHERE DOES THE DANCING TURKEY COME IN? One can say that generosity is the natural state of nature and humanity. Its just that many in the backwards first world have forgotten what it is like to be humane. All natural systems are self sustaining that are recycling their way through life in the intimate circles that we all participate in. Its just that our culture and state of mind are unsustainable which is about to reach a dead end point. Another idea is that each moment is an opportunity for celebration where a perfect union or marriage is established. This marriage has often been spoken of as a communion or a vow or commitment to god. Translating, this could be seen as whatever catches your attention... one becomes attentive towards which results in engagement. Such engagement then creates a union or connection of authentic one of a kind sharing. This then calls for a celebration without even having to plan a party. Truly living life then is an ongoing party where people learn to slow dance with each other until one loses their identity and who they think they are. One then gets absorbed by what one is focused on. One becomes then One with the love of their life. One becomes One with True Nature and all that is Humane.